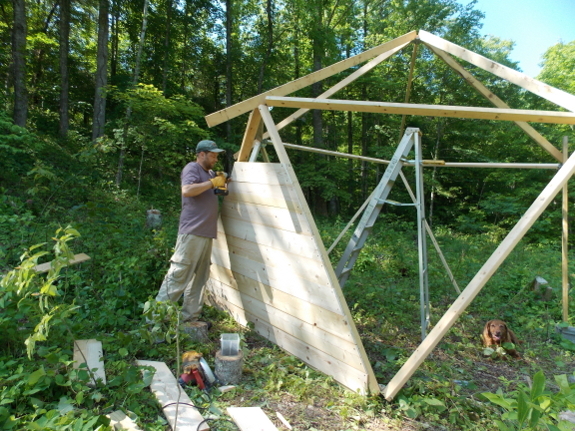 The easiest way to fill in the walls of a starplate chicken coop is using plywood...but only if you don't have to haul the wood to a remote location. 1"x8" boards are much easier to haul, and are not hard to cut to size on location. No wood will be wasted. The bitter ends will match back up to form the comparable portion of the next triangle over. No luck with the clay? It should still look pretty cool. Are the boards tounge and groove? If not you may want to put a thin strip vertically through each triangle to help keep the long boards from warping. I love the less waste aspect. Looks great! Michael --- Unfortunately, all of our "clay" areas that I tested turned out to be silt. Eric --- They're not tongue in groove, and you've got an excellent point on the warping. We were already going to have to run a piece of wood up the middle of half the triangles to mesh the end pieces together, but it sounds like we should do so in the solid triangles too. Thanks for thinking of that!